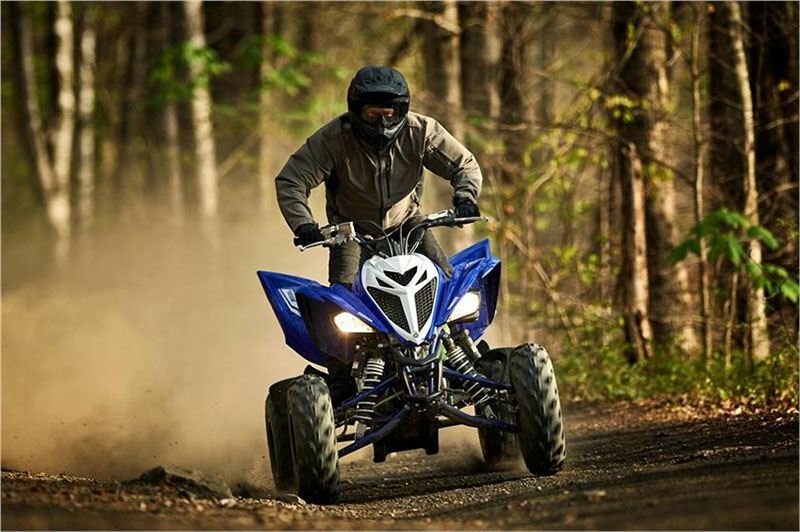 The Raptor 700R continues its dominance as the leader of big-bore sport ATVs with class-leading performance and comfort. 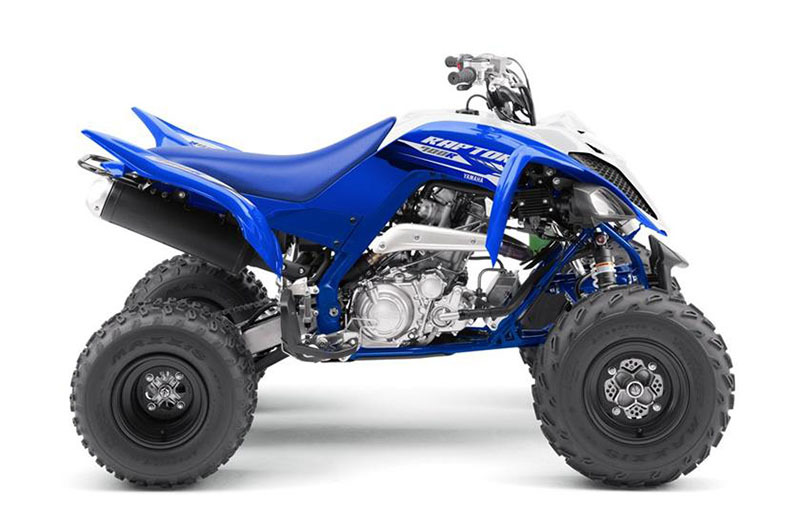 HIGH-TECH CHASSIS: State-of-the-art chassis combines a steel front section with an YZ-style piggyback rear shock gives 10.1-inch wheel travel along with preload adjustment. 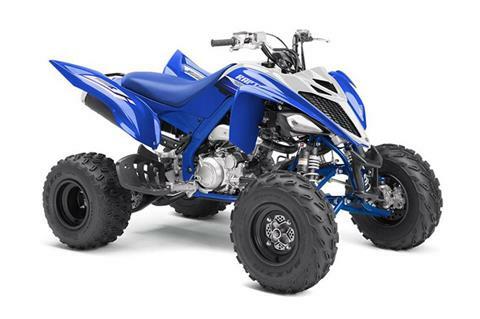 ADVANCED SUSPENSION: YZ-style piggyback shocks are fully adjustable with high- and low-speed compression adjustability for maximum sport versatility, along with preload and rebound adjustment. Front wheel travel is a plush 9.1 inches, while the rear shock provides 10.1 inches of wheel travel. POWERFUL BRAKES: Twin aluminum-piston front disc brakes deliver tremendous stopping power. Discs are drilled, which helps reduce unsprung weight for excellent suspension compliance, with an additional twin-piston rear brake for maximum stopping power. 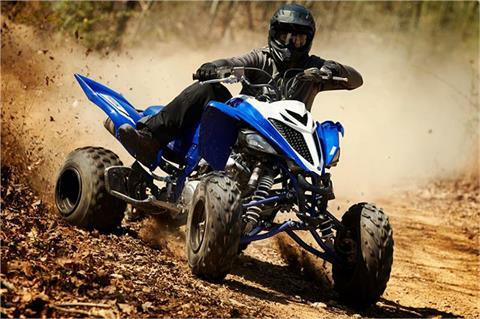 AGGRESSIVE MAXXIS® TIRES: High-performance front 22x10-9 and 20x10-9 rear Maxxis® tires with a specially designed tread pattern deliver superb, class-leading traction for razor-sharp handling in a variety of terrain and conditions. LIGHTWEIGHT WHEELS: Lightweight aluminum wheels help enhance suspension performance by reducing unsprung weight. WIDE FOOT PEGS: Race-inspired 45mm serrated foot pegs provide excellent boot traction. STRONG FRAME: Controlled-fill aluminum subframe is light and strong, as is the composite front grab bar. SMOOTH, POWERFUL ENGINE: Forged lightweight piston, connecting rod and crankshaft in the 686cc engine are light and strong, for a hard-hitting, quick-revving powerplant that revs all the way to 9000 rpm. Dual counterbalancers keep it smooth. 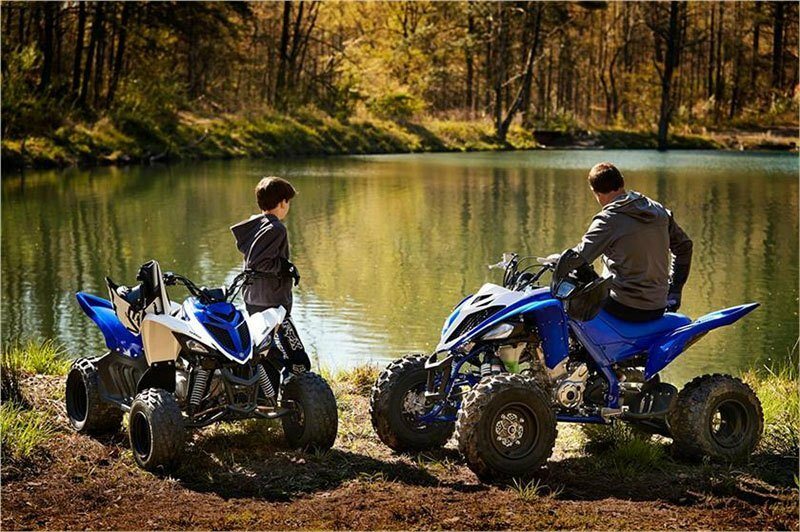 ADVANCED FUEL INJECTION: Yamaha Fuel Injection (YFI) means consistently excellent engine performance in a wide range of conditions, elevations and temperatures. DIGITAL IGNITION: Digital TCI w/32-bit electronic control unit controls fuel injection and ignition systems for consistent performance and fantastic throttle response. ELECTRIC START: Reliable push-button electric start in any gear adds extra convenience. 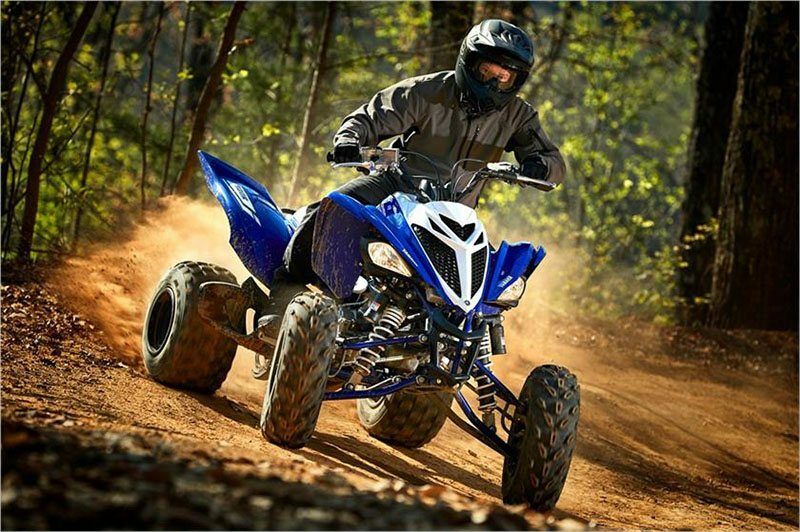 ROBUST TRANSMISSION: Race-bred five-speed transmission with reverse, along with Raptor 700R’s monstrous powerband, means there’s a choice of gears in just about all situations. YZ-spec ratchet shifter ensures smooth, resistance-free shifting under power. Heavy-duty clutch features sturdy basket and plates designed to harness the power. EXCELLENT SERVICEABILITY: Easy-to-reach oil filter and tool-free air filter provide added convenience. SPORTY ERGONOMICS: Long, YZ-style seat allows maximum rider comfort and movement with superb sport-riding ergonomics. HIGH VISIBILITY LIGHTING: Multireflector 30-watt Krypton headlights set back in the front cowl add the perfect no-compromises sporting accent, and an LED taillight provides great visibility. 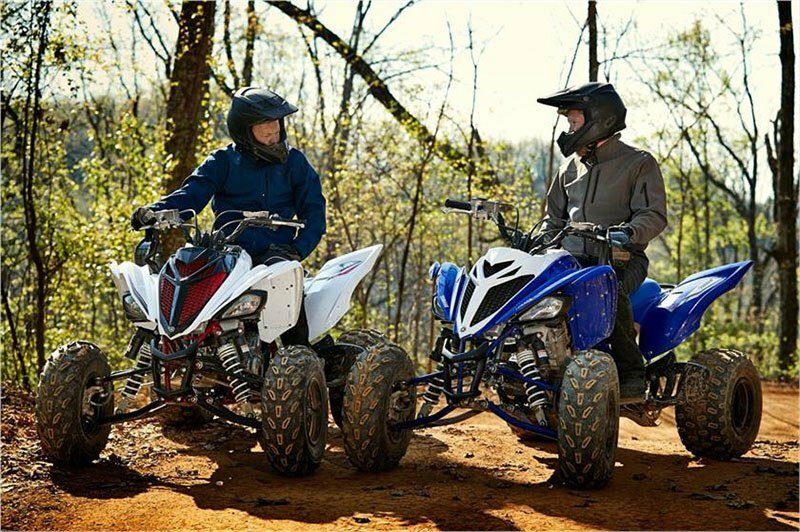 LARGE FUEL TANK: Large-capacity, 2.9-gallon fuel tank and Yamaha Fuel Injection (YFI) mean more time on the trail between fill-ups. ERGONOMICS CONTROLS: Thumb throttle lever has a smooth shape for a feel riders will appreciate, with less fatigue at the end of the day. Handlebar-mounted flip-type parking brake lever is simple to use. YAMAHA DIAGNOSTIC TOOL: The Raptor 700R is Yamaha Diagnostic Tool-ready for improved serviceability. ASSEMBLED IN THE U.S.A.: The Raptor 700R is proudly assembled in the U.S.A., alongside Yamaha’s 4x4 and Side x Side utility vehicles. AGGRESSIVE STYLE: Aggressive styling makes the Raptor 700R look as menacing as it really is. The mighty Raptor 700R is ready to go whether the destination is the dunes, the trails or the track. 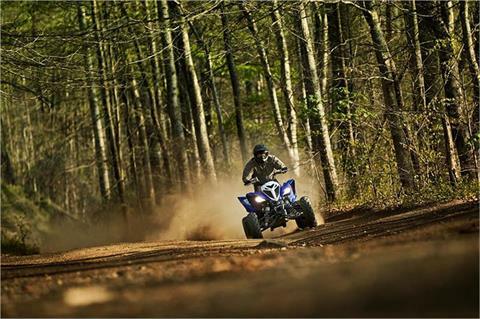 BIG-BORE POWER: Powered by our most potent big-bore Raptor engine ever – 686cc of liquid-cooled, fuel-injected power. The engine produces big torque right off idle, transitioning into a fat mid-range and monstrous top-end. ADVANCED CHASSIS: Big power and lightweight, a combination that makes any ATV rider take notice, is standard on the Raptor 700R, with a hybrid steel aluminum frame and Controlled-Fill aluminum sub-frame and cast aluminum swingarm combining to produce a super-strong structure and the lightest ATV in its class. RIDER-FRIENDLY FEATURES: A thick comfortable seat provides excellent comfort while the dual counterbalancers, electric starting, and reverse keep things nice and civilized when needed, but when it comes time to pull the trigger the big-bore Raptor 700R stands tall. ADVANCED SUSPENSION: The YFZ inspired handling of the Raptor 700R is incredible to experience blasting through the woods. Thanks to the 9.1 inches of front travel and 10.1 inches out back, the trail bumps smooth out while the rider keeps things under control. With the combination of power, solid handling, and a great suspension this machine has to be experienced to be fully appreciated.